Muay Thai or Thai Boxing is a combat sport from Thailand that uses stand-up striking along with various clinching techniques. It’s sometimes referred to as the ‘art of eight limbs’ as you use your fists, elbows, knees, and shins to form one of the most effective and powerful martial arts in the world. 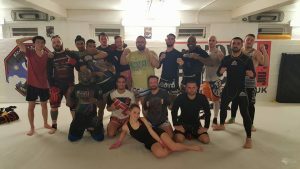 Students can take part in either our Basics, Mixed or Advanced/Sparring Muay Thai classes. If you’ve never trained before then we’d encourage you to come along to the gym and watch what the sessions involve or take part in a Basics class. Many students who train here started with no (or very little) experience so you’ll be fine! Equally, if you think you are experienced enough to attend an Advanced session please get in touch and let us know how much you’ve trained, if you’ve competed etc. Aaron (our Coach) does normally like to see everyone train in a Mixed session before they join the Advanced lesson but this obviously does depend on the above. For your first few Basic or Mixed classes all you’ll need are shorts and a t-shirt (with no zips and/or buttons on either item) as you’re welcome to borrow our boxing gloves to start off. However, if you already have your own wraps, gloves (16oz) etc. please bring them along too. As you get more experienced you will need your own hand wraps, gum shield, boxing gloves, a head protector, shin/instep protectors and possibly either a groin or chest protector. Just speak with Aaron when you’re here though and he’ll advise you on what to buy and when.